In Enterprise, a Dossier represents a story. All files that are related to the story are collected in the Dossier. These files include reference material such as articles and images as well as the files that are needed to publish the story. In a print workflow these are the InDesign layouts, InCopy articles and images. A Dossier is represented by a blue folder and can be expanded or double-clicked to view its contents. Figure: The Smart Connection panel showing 3 Dossiers, one of which is expanded to view its contents. 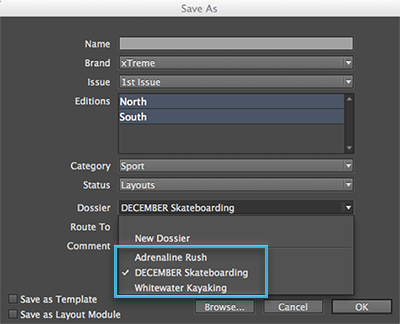 In a typical workflow, a Dossier is the starting point for locating the file that you want to work on in InDesign or InCopy. However, you can also create Dossiers from scratch and add files to it. This article describes how to work with Dossiers in Smart Connection for InDesign and in Smart Connection for InCopy. The Smart Connection panel. This is the default panel for locating a file in Enterprise, including Dossiers. To access this panel, choose Window > Smart Connection > Smart Connection. For more information about using the Smart Connection panel, see Using the Smart Connection panel in InDesign or InCopy. The Dossier panel (static version). This panel shows the content of a particular Dossier. To access this panel, double-click a Dossier in a panel. The Dossier panel (live version). (Smart Connection for InDesign only.) This panel shows the Dossiers (and their content) that the layout that you are currently viewing belongs to. When switching to another layout, the Dossiers to which that layout belongs are shown. To access this panel, choose Window > Smart Connection > Dossier. Tip: Use this panel to quickly access the files that are in the Dossier — such as the images that need to be placed on the layout — instead of using the Smart Connection panel to locate these files. The Show Dossiers panel. This panel shows all Dossiers that a particular file is part of. To access this panel, right-click a file and choose Show Dossiers. The Show Dossiers and Layouts panel. This panel shows all Dossiers that a file is part of and all layouts that it is placed on. To access this panel, right-click a file that can be placed on a layout (such as an article, image or an Excel file) and choose Show Dossiers and Layouts. The following images show the panels and their variations. In this scenario, the Smart Connection panel shows 3 Dossiers, with the Dossier named 'Adrenaline Rush' expanded to show the files for a story about rock climbing. Figure: The content of a Dossier viewed in the Smart Connection panel. Info: This feature is only available in Smart Connection for InDesign. When we open the layout that is in the Dossier and access the Dossier panel (Window > Smart Connection > Dossier), we now have a static panel that will show us the content of the Dossier for easy access. When needed, we can use the Smart Connection panel to locate other files in other locations. What is nice about using this panel is that it automatically shows the files of the Dossier that the layout you are currently working on is part of: when switching between layouts you see the content of the Dossier panel change. If needed, we can use the Issue list and Edition list to further filter the content of the Dossier. The Issue list only shows those Issues that have been assigned to the Dossier(s) displayed in the panel. Items that are part of the Dossier might have been assigned to a completely different Issue than the Dossier; it is not possible to specifically filter on those Issues. Editions for an Issue are only shown in the list when that Issue is chosen in the Issue list; when no specific Issue has been chosen yet, the only entry in the Editions list is [All]. Regardless of the filter settings, the Dossiers are always shown, even when the content of a Dossier is not displayed because of the currently active filter settings. Filtering is done based on data stored locally on the system; to retrieve the latest data from the Server, click Refresh. Note that the title of this panel is 'Dossier'. Figure: After opening a layout, the Dossier panel shows the content of the Dossier that the layout belongs to, thereby giving you easy access to those files. When double-clicking the Dossier in the Smart Connection panel, a similar Dossier panel is opened showing the content of that Dossier. However, the panel now shows the title of the Dossier, meaning that this panel will always show the content of this Dossier even when switching between layouts. Again, the content of the panel can be filtered by Issue and/or Edition. We can also right-click the layout in the Smart Connection panel and choose Show Dossiers. This will show all Dossiers that the layout belongs to. The title of the panel is now the name of the layout. The term [Dossiers] is added to the title to indicate the relation with the layout. Note that the Issue and Edition filters are now not present. Figure: A Dossier panel showing all Dossiers that a layout is part of. In this case it is only part of one Dossier. When right-clicking an image, article, or Excel file you can also choose the command Show Dossiers and Layouts. This will bring up a panel showing all Dossiers that the image, article, or Excel file is part of and all layouts that it is placed on. Figure: The Dossier and Layouts panel shows all Dossiers that a file is part of and all layouts it is placed on. Smart Connection panel. When a new panel is created, it is added to the Window > Smart Connection menu and to the menu of the panel itself. When closing the panel it is hidden (not removed) and it can be brought back into view again by choosing it from the menu. To fully remove it, choose Remove Smart Connection Panel from the panel menu. The Dossier panel (static version), the Show Dossiers panel and the Show Dossiers and Layouts panel. These panels are not added to the Window menu or the Smart Connection panel menu. When closing them they are also removed. (Requires Smart Connection for Adobe CC 2014 or higher). Each time one of these panels is opened it is added to the Window > Smart Connection menu and to the menu of the panel itself. When closing the panel it is hidden (not removed) and it can be brought back into view again by choosing it from the menu. To fully remove it, choose Remove Smart Connection Panel from the panel menu. The Dossier panel (live version). The panel is not added to the Window menu or the Smart Connection panel menu. When closing the panel it is also removed. Bring up the Check-in dialog box or the Save Version dialog box for a layout. Bring up the Check-in dialog box or the Save Version dialog box for an article (see Closing or saving an article using Smart Connection for InCopy). Step 2. Enter a name and set the properties for the file. Step 3. From the Dossier list, choose New Dossier. Figure: The 'New Dossier' option in the Dossier list. The file is saved in Enterprise and added to the Dossier. Step 1. Select one or more files in a panel such as the Smart Connection panel or the Dossier panel. Note: The selected files can be of any type except other Dossiers. It is also possible to select files that are already part of another Dossier. Step 2. 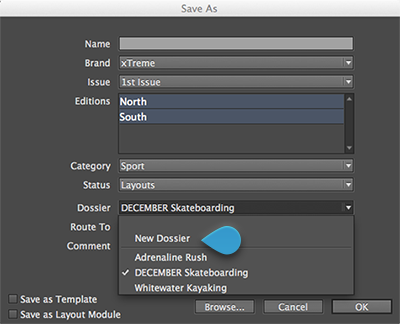 Right-click any of the selected files and choose Create Dossier... from the context menu. The Create Dossier dialog box appears. Step 3. In the Name box, enter a descriptive name. .The Dossier is created and the selected files are added to it. Note: Make sure that the files that you are dragging are all stored in Enterprise, otherwise the file cannot be added. Step 3. From the Dossier list, choose an existing Dossier. Figure: Various existing Dossiers in the Dossier list. Step 1. Display the Smart Connection panel in List View mode (as opposed to Thumbnail View mode). In the Smart Connection panel menu, choose Show as List. Step 2. Click the expander in front of the Dossier from which the file needs to be removed so that all files in that Dossier are visible. Figure: A Smart Connection panel viewed in List View mode with one Dossier expanded. Step 3. Select one or more files. Step 4. Right-click any of the selected files and choose Remove from Dossier. A message appears, asking to confirm the action. The selected files are removed from the Dossier. Step 6. (Optional) Click Refresh to update the content of the Dossier. 22 October 2018: Updated section 'Saving the file' by adding information about invalid file name characters.